A CROCODILE made out of recycled tyres, a car filled with foliage, and a life-size snakes and ladders board – these are just some of the many creative green treasures, still to be discovered in the local area. The Green Treasure Hunt was launched by local photographer Chrissie Decker at the beginning of August, and has proved popular with families over the summer holidays. The project is commissioned by the Bristol 2015 Neighbourhood Arts Programme, as part of the city being awarded Green Capital status. 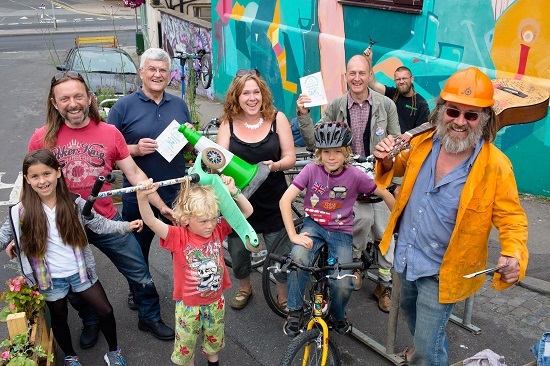 The trail, which runs until September 13, includes five pop-up ‘street pockets’, as well as a number of hidden art works – all relating to the Bristol Green Capital themes: energy, food, nature, resources and transport. Chrissie says that she hopes that the trail will send residents on a journey of discovery, while inspiring them to try active travel. To find out more, or to download the map, visit: www.greentreasure.net.